Austin has always done a great job. I also appreciate the auto reminder call a few days ahead of the service date. Your staff are always friendly and do a great job. One of the things I appreciate in finding a more eco conscious pest control company is they listen to your concerns and actually tailor your pest control product choices to your level of comfort. You have a specific say in what is used. You guys keep me sane. Hearts Managment has been professionally, easy to contact and affordable. Excellent service from your technicians. They are always polite, careful, and skilled. We have used your service for 4 years and will continue. Great company! We get the green essential oil service every other month and have no pest problems, thanks Hearts!! Always happy with our service. I have only once seen ants between my usual service dates and they were just congregating outside around my hummingbird feeder. David is very friendly and it was a pleasure to see him and catch up today. Excellent experience as always! David is an asset to your company! This is the second month in a row that we have gotten an ant infestation within hours of the service being administered. I was very pleased with my experience. From making an appointment to rescheduling was really easy and fast. Overall the service was excellent. From the operator to the tech on site very friendly, on time and knowledgeable. In the past I saw significantly less earwigs and spiders indoors after treatment. That is no longer the case. In addition, if cobwebs formed on the exterior they would be cleared away before treatment. That was not completed. I have called regarding this before. Please advise. Everyone was polite and professional. and took the time to answer all of my questions. Robert is knowledgeable, personable & represents your company well. Called having a huge problem with ants and was so grateful that you were able to come the same day! For many years we enjoyed great, responsible service by Gabriel. Gabriel recently left Hearts and has been replaced by Robert. I don't know what kind of training Robert has received or if he is cutting corners, but today, several hours after our treatment, I used my hose in the backyard and found he had turned off my dogs water after apparently filling his container, and did not bother pushing the hose away from the wall as he sprayed all over the hose. How do I know this? My hands are covered in the smell of the pesticide as well as the hose. If I had not moved our shoes away from the back door would he have just sprayed over those too? This same technician treated our business and offered several times to spray in a specific area that the former technician said was illegal. I'm done. You guys don't know how to schedule people. My wife was there at 8am for a scheduled appointment. You guys forgot and sent out Robert who doesn't know what he is doing. He tried to leave without even finishing the job. My wife told him what to do. You guys are not worth it and we are CANCELING service. We've already given you many chances. I am very disappointed to know that service was done today ,but I think nothing was done and there was no service statement left after the service which I feel was not done. Very helpful considerate technician. Price for full service is a bit high. Excellent. Solicits and accepts suggestions. Less than 1 year. Gabriel is a great communicator and very knowledgeable. We had our first visit a few weeks ago because of an infestation of fire ants. The ants started in the back yard but started coming into the house. My organic/natural solutions were helping but not stopping the infestation. We haven't had our second/follow up visit yet so it's hard to comment on the green thumb every other month. two months now and the service tech is very nice and listens to our concerns. 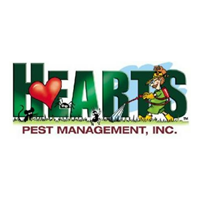 I've been using Hearts Pest Management for about 8 years. We use their green bimonthly service and their monthly rodent bait service. They seem like they care about their customers, their work and the effects of their work. I also feel confident I can trust them. I've had bad experiences with other pest control companies charging for services that didn't work and in some cases were never even performed, even though they were paid for. Hearts isn't like that at all.